Are you trying to find the highest quality landscaping services Southampton has ever had available? If so, then your quest is finally over now that you have landed at Abbey Turf. Whether you want to touch up a few bits in your garden or you are looking for a complete transformation of the entire outdoor area, our landscapers will be able to create a fantastic custom solution. Get in touch with our friendly team of professionals at your earliest convenience on 02380 812 302 or 07887 942 242 for more information. Whether you already have a design in mind and you are simply looking to discuss it with a group of experts offering landscaping services in Southampton or you’re fully open to ideas, Abbey Turf is here to help. Please keep reading to get a better overview of all the services we provide for customers in Southampton and beyond. Our hard landscaping services involve the use of solid building materials such as stone and brick to create garden features that will leave you and your guests speechless. Some of the most popular choices that people request from us are custom patios, paving solutions, new walls and bespoke garden ornaments. When you enlist our team to create these features for you, you will be able to turn your garden from something run of the mill into something positively regal. From the initial informal phone call where we will discuss your ideas all the way up to the final handover of your brand new garden construction, our team will be there every step of the way. Known for our customer service skills as much as our design innovation, Abbey Turf will be your one stop shop for all garden solutions. From custom brick barbecue setups to new garden walls to large summer houses, the sky really is the limit when you enlist our Southampton landscaping services. 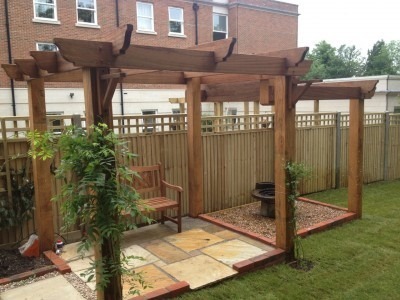 Why choose Abbey Landscaping for your landscaping services in Southampton? Whether you have already enlisted our landscaping services in Southampton in the past or you are still deciding between a few different providers, we would highly recommend that you have a browse through the rest of our easily navigable website. You will be able to find out more about us as a company and everything we have done to become the number one provider in the area. Don’t forget to check out our online gallery for an excellent selection of high quality images of previous projects our landscaping services in Southampton team has carried out to the delight of our customers. We are beyond confident that seeing our team’s skills first hand will give you further inspiration for your own project. Should you still have any questions, please do not hesitate to reach out using one of the contact methods outlined below. If you are now convinced beyond a shadow of a doubt that the Abbey Turf team offers the top choice in landscaping services Southampton can provide, then there are several quick efficient ways to contact us. Please do not hesitate to either call us directly on 02380 812 302 or 07887 942 242, e-mail your requirements right on over to info@abbeyturf.co.uk or fill out our online form. We will always respond in a timely manner.